The poor old Brussels sprout, it has had such bad press for the longest time ever, more synonymous Christmas and over-boiling, than giving them the true respect they deserve. Brussels sprouts are a delicious vegetable and below you can find just why they are so, so good for you. So, it is time to forget the boiling and start roasting them. 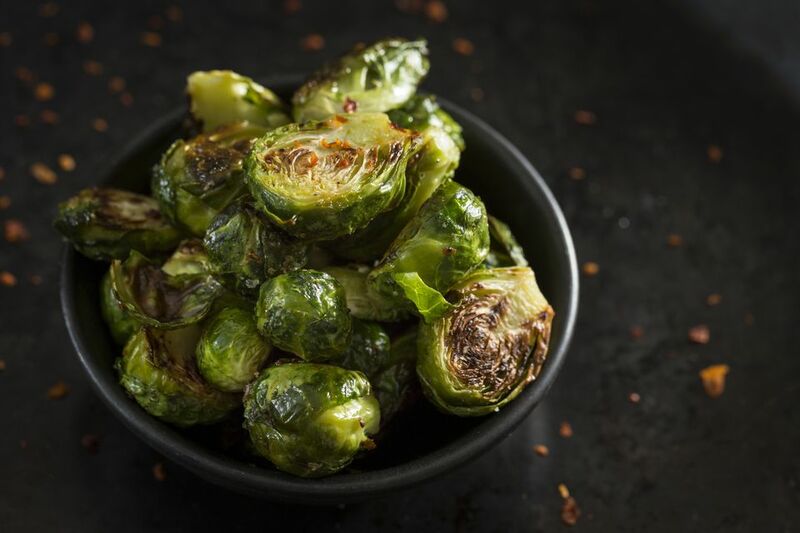 A short, quick roast in the oven with a little oil and a sprinkle of sea salt creates a nutty, sweeter and far tastier Brussels sprout than you could ever imagine. And even better, it is so easy to do. So easy, you will probably never boil them again. Take the washed sprouts and remove any outer leaves which may be yellowing or wilting. Pulling these away you should find smooth, shiny, tightly packed leaves. If this is not the case and the leaves are 'blown' (not tightly packed) discard the sprout. Trim any excess on the base which is dirty or damaged too, making sure you do not cut into the leaves. Leave the sprouts whole, only if they are very large should they be cut in two. Lay the Brussels sprouts on to a baking sheet. Sprinkle the sprouts with the olive oil *** roll the sprouts around to make sure they are well coated in a the oil. Sprinkle over the sea salt flakes and give the sprouts a good shake. Place the tray into the centre of the preheated oven and roast for 20 minutes or until the sprouts start to brown on the outside but are not burnt. Prod the sprout with a sharp knife to see if it is tender, if not, cook longer. The length of time depends on the size of the sprouts, so keep an eye on them. Roast Brussels make a great stand alone vegetable or can be part of a bigger mix such as roast carrots, parsnips and other roots, however they will cook much faster so only add them towards the end of cooking or they will simply burn and taste bitter.